Fast forward several years, banh mi has become an obsession---everywhere. They come in so many different variations (I'm still partial to the classic) and twists. It's amazing to think that this simple food that I grew up eating because it was cheap has become a cult favorite for foodies everywhere. Being in New York, I find it hard to find good Vietnamese food. This has a lot to do with growing up in a household with delicious home cooking so no place really measures up. However, when a craving strikes, I must satiate. Bad things happen when I ignore the craving monster, i.e. me consuming massive amounts of whatever I was craving. 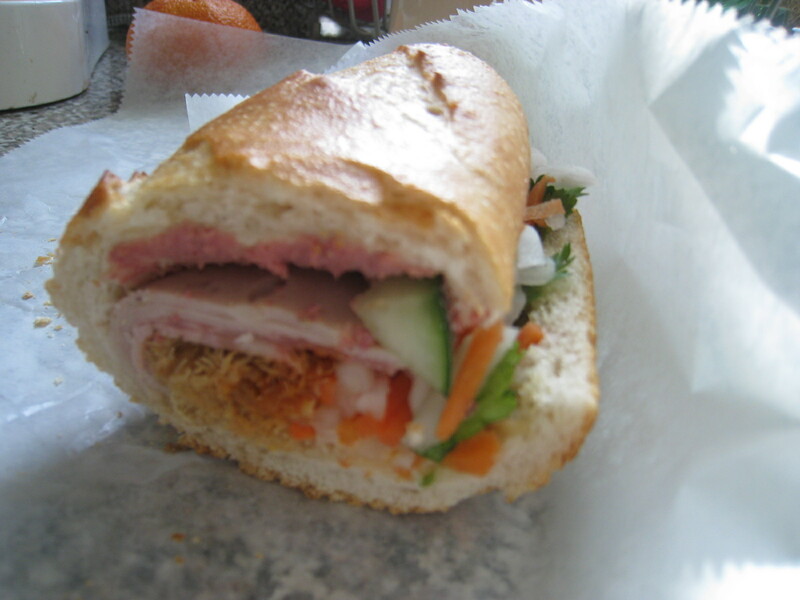 While waiting for a repair at the Apple store this afternoon, I had read an article that listed the top 10 banh mi sandwiches in New York City and the number one banh mi was conveniently located near my apartment at Banh Mi Zon. I've tried the sandwiches here a couple times and have always liked it so figured I could give it another go. I must say, this sandwich hit the spot. I devoured it quite fast and wanted another. The bread was crunchy and fresh. There was a perfect ratio of pate and meat. It could have used a bit more pickled vegetables and cilantro but that's a minor complaint. i found a place in chinatown here that sells banh mis and they even deliver! but i think they're not as good as the ones in ny. and it's kinda pricey... $5.50! more expensive than baogette.